I love the Italy posts Satu has been writing the past few weeks. I know it’s one of your favorite countries, at least according to our Facebook poll this spring! 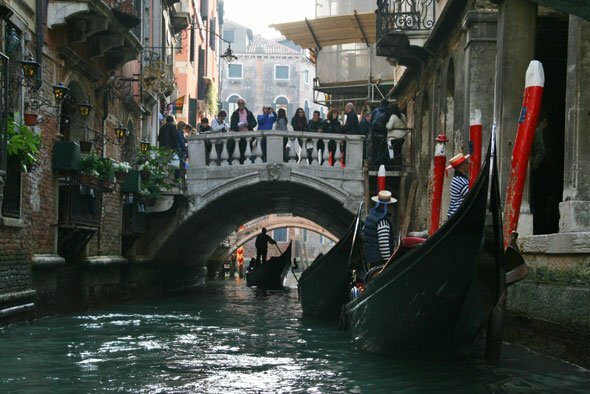 If you are inspired to book a trip to Italy and visit Venice, here is my hotel recommendation for you. The above photo is taken from the balcony of our hotel suite. 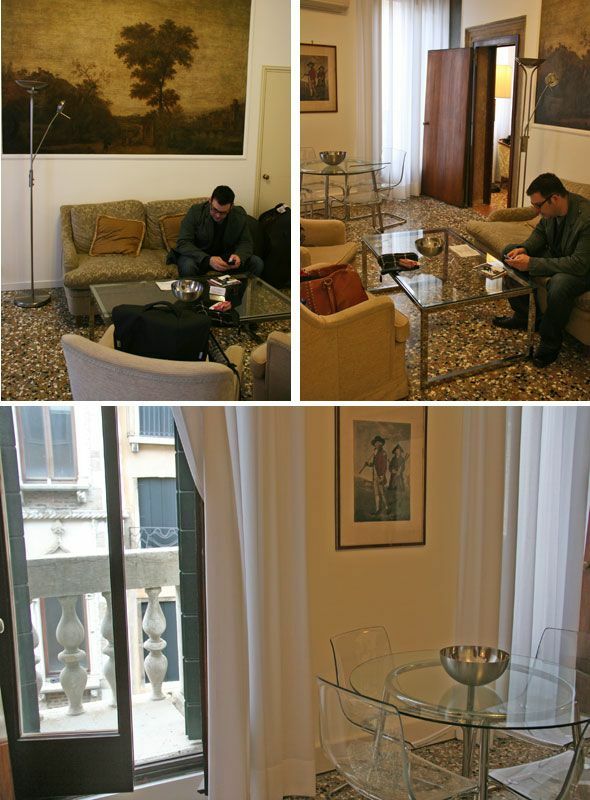 We stayed at the Residenza Ca’Foscola during our stay in Venice, and I highly recommend this small hotel, it surpassed all of our expectations. We are a family of five, and I’ve noticed that traveling in Europe with a large family is much more difficult than in the US, and there are not nearly as many options. Residenza Ca’Foscola had an amazing two room suite with a kitchen, for under $300 per night, making it a luxury on a dime when compared to other hotels in the area for a family of five. 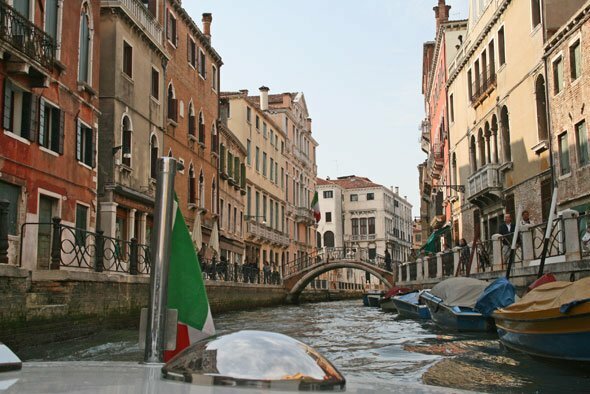 If you are traveling to Venice for the first time, I highly recommend taking a water taxi directly to your hotel. I had never been to Venice before but my husband had, so he got us a water taxi to take us directly to our hotel. You can of course take the public transportation boats and then walk to the hotel, but I loved the grand entering to the city with the gorgeous old wooden boat. I was absolutely blown away by Venice the moment we stepped out of the train station and into the water taxi. I also think it might have been difficult to find the Ca’Foscola for the first time without taking the water taxi, even though it is very centrally located and close to the public water transportation by the Rialto bridge. The Ca’Foscola is not your typical hotel. There are no large signs, no big lobby, but you use a buzzer for the owner to buzz you into the small lobby with a courtyard. There is no elevator, but the hotel has only a few floors. We were on the top level, and were glad again we had packed lightly when carrying our luggage to our room. I wish I had taken more photos of the hotel room, but this was a family vacation, not a travel work trip for me, and unfortunately I didn’t take many good photos of any of the hotel rooms, and my family is on these pictures too. Our room was the largest in the hotel (ask for it – it’s the room #7!) and it had two bedrooms with large Cal King sized beds and the other bedroom also had an extra bed set up for the kids. All three kids wanted to sleep in the same gigantic bed, so we didn’t even need the extra bed. The hotel suite was more like a small apartment with two bathrooms, a small kitchen and a living room area with a dining table and couch. The room had some of the original 700 year old wall paintings still on the walls, and original gorgeous stone floor, and two balconies with a view to the canal. I could have moved right in! The hotel breakfast was not your typical hotel breakfast. The food was delivered to your room the day before and you could make your own breakfast as you wished on the morning. The breakfast included toast with jam and butter (and Nutella! ), croissants, cold cut meats, yoghurts, cereal and other local crackers and biscotti. We loved making our own café lattes every morning and just relaxing before our day in Venice. 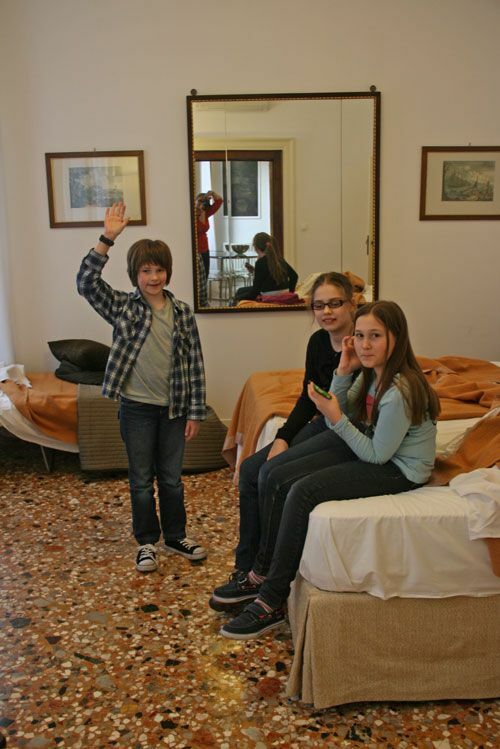 Kids loved the Italian toast, and the easiness of eating in the room. I loved the coffee, it seriously was the best coffee I’ve ever had, and I still think about it almost weekly. I even bought learned in the trip how to use the Bialetti stove top espresso maker and bought it at home as well, but there was something special at the coffee at the Residenza Ca’Foscola – I just can’t get it the same at home. There was also a grocery store close by and the owner of the hotel will show it to you on the map. 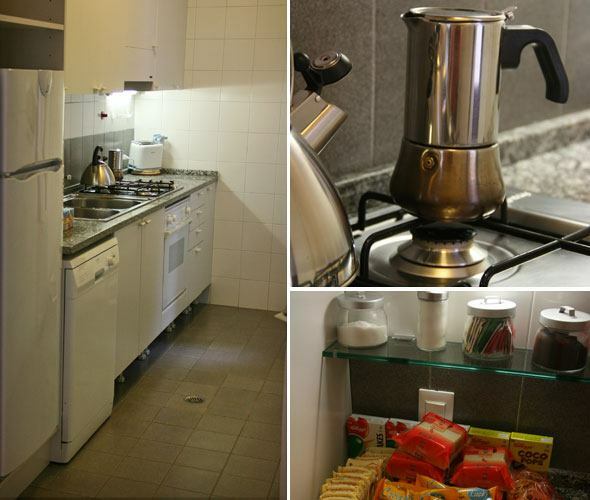 You could easily cook lunches or dinners in the hotel suite as well during your stay. We stayed at the Ca’Foscola for four days but ate out all lunches and dinners, mainly because we were out and about exploring the city all day long. I highly recommend eating at the Da Mamo pizzeria close by the hotel – it was by far the best food we had in Venice. Most of the restaurants were so-so or plain bad, and way over priced for the food we ate. Don’t believe what they say about not being able to find a bad meal in Italy, in Venice you can – once my daughter even got raw meatballs, and we heard them trying to cook them more with a microwave oven. Avoid all restaurants that have people trying to get you in, and stick to the hotel owner’s recommendations. In retrospect we should have cooked in and taken advantage of the kitchen in the hotel suite. 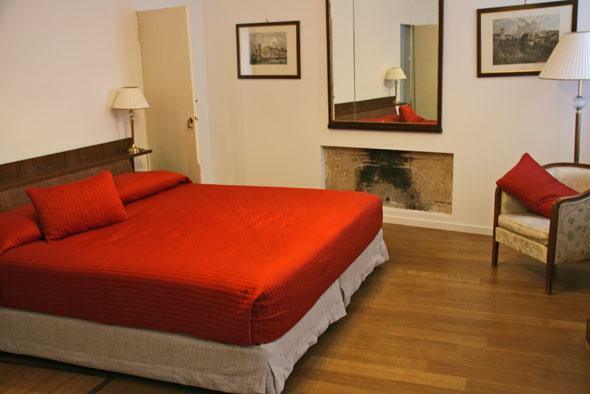 I would definitely stay again at the Ca’Foscola, and recommend the hotel for anyone looking for a hotel in Venice. 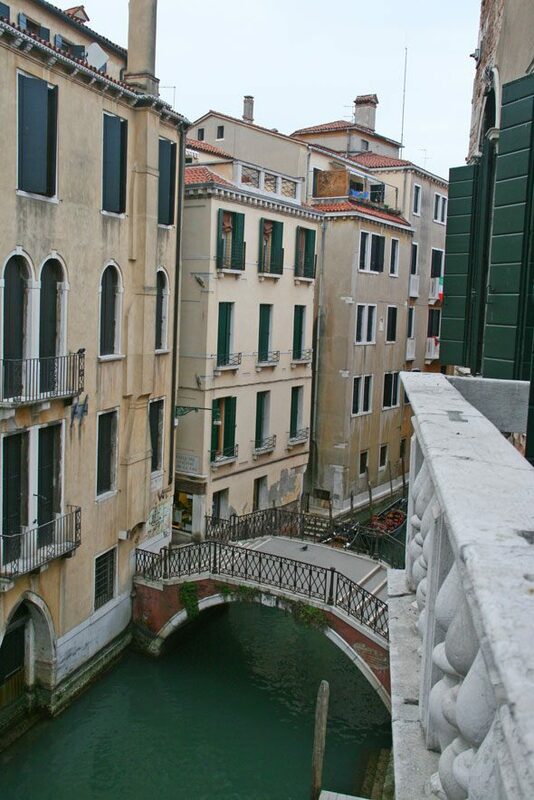 I want to warn though – the street sounds from the nearby bridge, piazza and canal did echo to our room, and it wasn’t very quiet to sleep. During the weekend the streets very busy late and during the week the hustle of the delivery boats and trash removal boats started after 6AM. We didn’t mind too much, we wanted to get up early anyways, and for some reason kids were not bothered at all. 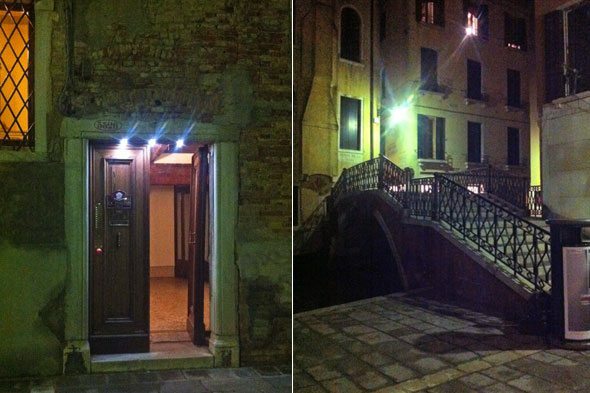 Oh, and like said, the hotel doesn’t come with big bright neon signs – this is how it looks in the dark in the neighborhood, it’s very magical in the dark Venice. 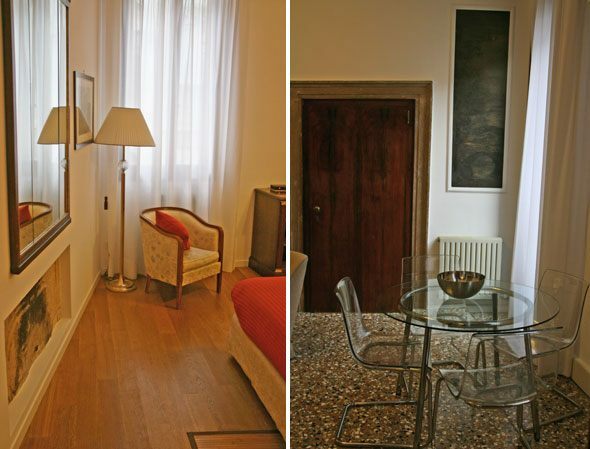 More info & booking the Residenza Ca’Foscola at Expedia. Want more travel posts? Subscribe to Skimbaco Travel via email.